The unspoken failure of Google's Glass has not deterred Sony from forging ahead with its own face-attached augmented reality device, and interested early adopters can now place a pre-order for their own set of "SmartEyeglass Developer Edition" eyewear for delivery in March. Given the unquestionably Sony-like designation SED-E1, the company's new wearable —first revealed last fall —is similar in appearance to an early pair of active 3D glasses. The 77-gram glasses pack a 3-megapixel camera as well as a complement of positioning and environmental sensors including an accelerometer, gyroscope, compass, and brightness sensor. Computation is handled by a Bluetooth-attached Android smartphone, with text and images projected onto lenses over both eyes for a three-dimensional view. Sony says the lenses are just 3 millimeters thick with 85 percent transmittance. 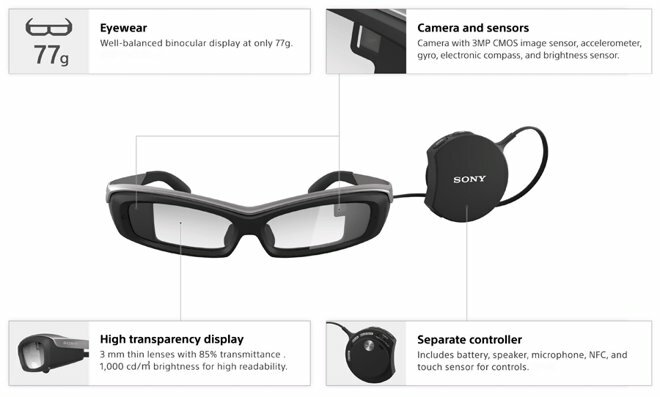 According to Sony, the display module uses proprietary "hologram optics" technology. "Holographic waveguide technology entails the propagation of image light that is output from the optical engine, using holographic optical elements embedded in both sides of a glass plate," the company said in a release. "The light is propagated through the extremely thin (1 mm) glass plate and then delivered to the eyes." Unlike Google's Glass, Sony has included a tethered control pod. The disc-shaped controller includes a battery that will power the SmartEyeglass for up to 150 minutes, as well as a speaker, microphone, NFC chip, and touch sensor. 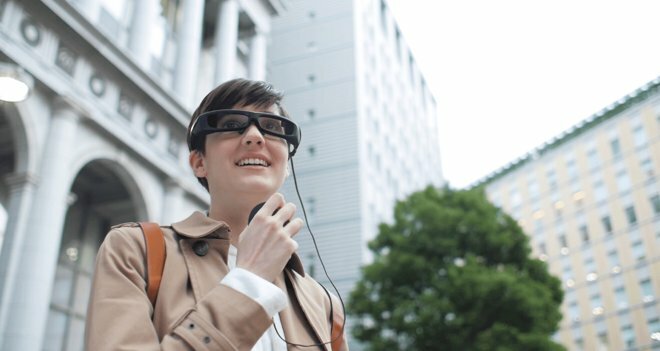 As expected, Sony will also release an official version of the software development kit it has been previewing to developers since the SmartEyeglass's unveiling. The SED-E1 SmartEyeglass Developer Edition is now available for pre-order in the U.K. and Germany. Distribution will be expanded to Japan and the U.S. —where it will cost some $840 —on March 10th.